At harvest time last year, I stayed in the smallest vineyard in Bordeaux: in the grounds of Le Saint-James, a Relais & Château hôtel d'architecte with a Michelin-star restaurant, which is 10km southeast of Bordeaux in a little enclave called Bouliac. Wine and top-end food… what's not to like? Even though I was on my own, I was happy enough to sit toute seule in the restaurant, and work my way through an extremely good tasting menu and wine list. But back to the harvest. I had just missed it. 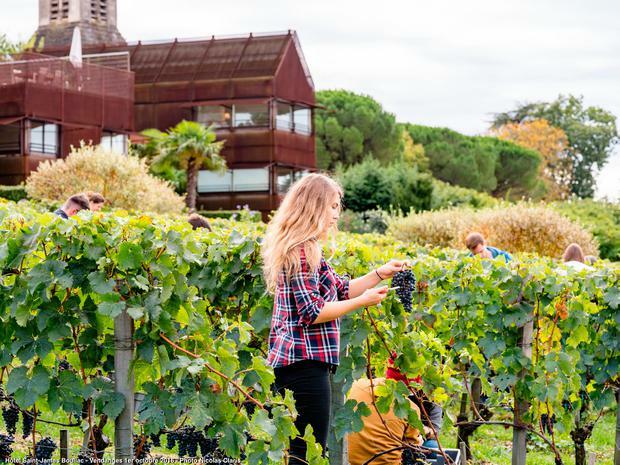 While you cannot plan the weather, and therefore the exact time of harvest, if you stay in Le Saint-James when it's under way, you can get involved. It is just a few hours' work, as they only produce 600 bottles of wine a year, but it is, apparently, a load of fun. More recently, I was back in Bordeaux, and this time it was to visit some of the vineyards. There are nearly 300,000 acres of vineyards in Bordeaux and, although people mostly associate it with red wine, it also produces white, rosé, sweet, and sparkling wines, which range in quality from the best wines in the world to straightforward Vin de Pays. One of the vineyards I visited was Château Loudenne, a winery on the left bank of the Garonne estuary, 17 km north of Pauillac, which has quite a history. Built in the 17th century, it is one of the oldest châteaux in the Bordeaux region, and also one of the most charming. So charming in fact, that it had a reputation as the party château starting back in the roaring twenties, and over the years guests have included Winston Churchill, Bobby Kennedy and Princess Margaret. And if you're a fan of The Crown on Netflix, you can only imagine how much fun those parties would have been. In Bordeaux, all of the best vineyards are on the banks of the river, because it has a moderating influence. So if it's a bit cool, the heat reflects off the river, and when there is a severe frost, as there was last year, the impact is less in these areas. Château Loudenne is wonderfully positioned, with vineyards that gently roll from gravelly hills where Cabernet Sauvignon is planted, right down to its private harbour where Sauvignon Blanc grapes are planted in the clay soil. It is quite amazing to see the difference in soil in such a short stretch, and in many ways, it sums up what is great and unique about Bordeaux. It is a particularly beautiful vineyard (and completely free to visit). The château, which is a dusty pink, is flanked by gardens and masses of roses. There are four follies, which are like pretty decorative towers, and the quiet harbour leads out to the Gironde estuary. With a wide stretch of river, there are sand banks in the middle, one of which is an island with lush trees and a destination restaurant, which apparently is worth the special journey. Along the banks, small fishing cabins on stilts are dotted along the coast. Although the terroir at Château Loudenne is very similar to the top-rated châteaux, where wines sell for hundreds of euro, it is not rated Grand Cru, but rather Médoc Cru Bourgeois Supérieur. While it's not an everyday €10 bottle, you can pick up a bottle for just under €20 at the winery and, for the quality, it's well worth it. For years, Château Loudenne was owned by the Gilbey family, the UK and Ireland gin makers. Then, after a series of owners, it was acquired by a Chinese company, which has invested heavily in the vineyard and employed Philippe de Poyferré, a highly regarded winemaker, to oversee the restoration of the vineyard to its former glory. The wines are once again starting to pick up gold medals. If you're looking to hit the big guns of Bordeaux, put the D2 route in your GPS and explore the Route des Châteaux. It's a stunning drive, with vineyards as far as the eye can see. The road signs are a roll call of some of the most expensive wines in the world - Margaux, Latour, Lafite and Mouton Rothschild, Palmer, Léoville Barton, Pichon Baron, and Cos d'Estournel. You need to plan ahead to visit these châteaux, or you can take one of the vineyard tours from Bordeaux. I visited Château Angludet in Margaux, a small family-owned vineyard that is organically farmed, but just as you begin to think this is the most amazing lifestyle, you discover they lost 85pc of their harvest to frost last year. Then there are the lucky ones. Château Pichon Baron in Pauillac is one of the Disneyesque châteaux with fairy-tale turrets. Close to the banks of the Gironde, they dodged the devastating frost so the wines for the 2017 vintage are looking good. Château Langoa-Barton, just down the road in Saint-Julien, is also worth a visit. The Barton family are one of the most famous of the Irish 'wine geese'. This week, I have a line-up of Bordeaux wines. They range in price, so if you spend a bit more, you're going to get a better sense of what makes this region so special. Pronounced, ripe and juicy on the nose, this has an elegant touch of perfume, with a good concentration of red plum and blackcurrant flavours on the palate, a savoury touch of cedar and a long finish. Broad and rich on the palate with aromas of white blossom and tropical fruit, this full bodied white wine has refreshing citrus acidity making it perfect to have with fish or simply to enjoy on its own. A Merlot-based Bordeaux from the right bank, there's plenty of savoury dark plum layered with blackcurrant and hints of tobacco. A blend of 75pc Sauvignon Blanc and 25pc Sémillon, there's a delicious roundness to this well-structured white Bordeaux with flavours of lemon, stone fruit and a touch of cloves sitting on a mineral palate with a hint of herbs. With aromas of violet and flavours of redcurrant, cranberry, blackcurrant and bramble on the palate plus a touch of cedar, this good-value Bordeaux would go very nicely with a chargrilled steak. For a special occasion or very special birthday, this finely structured wine has the intensity of fruit that you associate with top Bordeaux featuring the characteristic note of graphite running through. Made from a blend of Merlot, Cabernet Franc and Cabernet Sauvignon, this is ripe and juicy with generous red fruit, a touch of spice and liquorice, and nicely integrated tannins. Not what you'd expect from Bordeaux, the Malbec grape is permitted in the AOC but rarely used alone. With plenty of blueberry, spice and peppery notes, this is light, fresh and easy drinking. A biodynamic wine that shows wonderful vibrancy, this blend of predominantly Merlot with some Cabernet Franc, Cabernet Sauvignon, Malbec and Carménère is bursting with ripe fruit in a beautifully structured wine. Fresh, with fleshy plums and firm black fruit adding structure, this has a delicious savoury quality supported by firm, ripe tannins.